When Natalia Isabel Novgorod submitted her first project, the KV-12T Lev supertank, her father Mikhail, head of the Novgorod Design Bureau on Ophiucis IV, nicknamed it Bel’s Kitty. Armed with a massive rail gun for offense and four remote weapons stations for defense, the KV-12T was indeed a kitty with sharp claws. Then Bel showed her father the KV-12BMP version, an infantry fighting vehicle capable of carrying a platoon. Visions of Novo-rubles danced in his head. 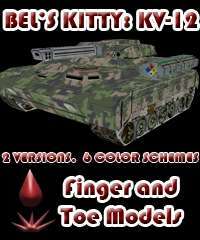 Finger and Toe Models announces the release of the 28mm card stock Bel’s Kitty, the KV-12 Lev, a supertank to support your armored assaults or an IFV to carry your troops into battle. It’s six inches wide and seven long. This is a sci-fi tank that can command respect. It comes in two variants: the KV-12T tank and the KV-12BMP infantry fighting vehicle. Six camouflage schemes are included. Remember, every Finger and Toe model comes with SMOOSH ASSURANCE: if ya’ll smoosh your Bel’s Kitty, the KV-12 Lev, a new one waits your summons from hard drive and printer.